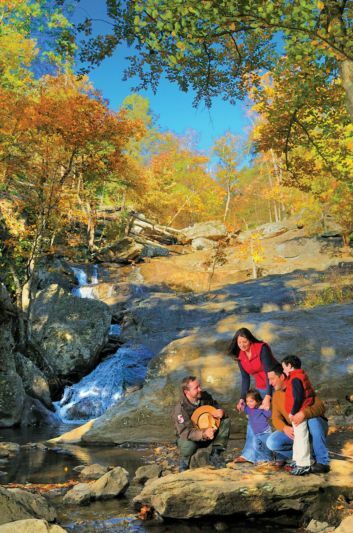 Hiking can be enjoyed year round in Frederick County, but fall is one of the best times of year to experience the beautiful scenery. Trails vary from easy to moderate, and, in a few cases, slightly strenuous, for the more seasoned adventurer. Here are 10 opportunities to commune with nature, geology, history and culture. This National Park Service unit offers pathways that traverse one of the oldest mountains in the country (Catoctin Mountain). Trail destinations lead to breathtaking vistas of neighboring environs along with unique geologic landforms such as Chimney Rock and Hog Rock. The Blue Blazes Whiskey Still Trail interprets the local tradition of moon-shining, a popular, yet illegal activity during the Prohibition period of the 1920s. The payoff for embarking on the Lower or Cliff Trails is being able to take a selfie at Maryland’s highest cascading waterfall. 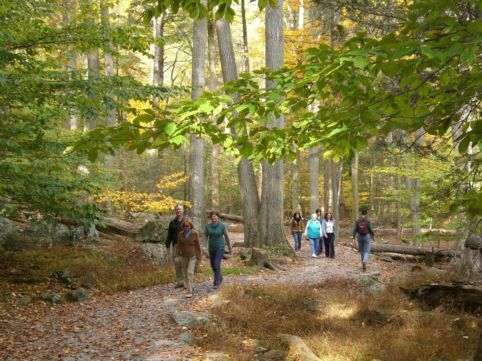 Another featured hike, the Catoctin Furnace Trail, takes visitors past ruins of a once-prosperous iron furnace operation that originally went into blast at the onset of the American Revolution. Named for a former Frederick businessman and conservationist, James H. Gambrill, Jr., Gambrill State Park was constructed during the Great Depression as a Civilian Conservation Corps project. Breathtaking views of the Frederick and Middletown valleys are afforded with overlooks, connected by a loop trail that goes around the 1,600 ft summit of High Knob. Frederick County contains 15.7 of the entire 184.5 miles that comprise the Chesapeake & Ohio National Historical Park. A level hike along the canal’s old towpath provides picturesque viewsheds of the adjacent Potomac River, not to mention a tranquil natural setting that served as home to earlier native Indian tribes such as the Tuscarora and Piscataway. Remnants of the early transportation heritage of our country exists along the trail in the form of aqueducts, locks and lock houses, railroad stations and a pivot bridge. The centerpiece of Gathland State Park is the War Correspondent’s Memorial Arch, built atop South Mountain in 1896 by author George Alfred Townsend. Here’s your opportunity to sample a portion of one of the most famous hiking routes in the country –the famed Appalachian National Scenic Trail as it intersects Gathland’s parking area. Although the “AT” runs from Georgia to Maine, you are free to do as little or as much as you want, with the biggest decision being whether to head north or south on the trail. South Mountain State Battlefield was the site of the first major Civil war battle on northern soil. A great trail exists at Fox’s Gap, known as the Gen. Garland Trail. 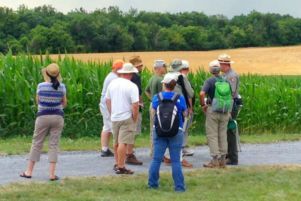 This short loop walk begins at the site where Union commander Jesse Reno, namesake of Reno, Nev., was felled on September 14, 1862, in the prelude to Antietam. Gen. Samuel Garland and his North Carolinians held the gap for most of the day’s fighting. Their brave stand is celebrated through the erection of the North Carolina monument, which serves as the midpoint of the hike. The Battle of Monocacy that occurred here in July, 1864, has become known as “the Battle that Saved Washington.” Follow in the footsteps of the soldiers of both armies while learning about the legendary Union stand against a much larger Confederate force on the banks of the Monocacy River. Options vary with two trails each at the Worthington and Best Farms, a nature walk called the Brooks Hill Loop, the Gambrill Mill Loop, and more. Another hike along the Monocacy can be found at Rivermist Park. Despite its close proximity to the City of Frederick, major roads and shopping, hikers can spot plenty of wildlife here, while sensing a feeling of remoteness. Catoctin Creek Park and Nature Center within the Middletown Valley, about 20 minutes west of the City of Frederick, hosts four miles of footpaths that basically form one large loop. Some trails take you over Catoctin Creek itself. Have you ever hiked a monadnock? Well here’s your chance! This is an isolated rock hill, knob, ridge, or small mountain that rises abruptly from a gently sloping or virtually level surrounding plain? In addition, Sugarloaf Mountain is a monadnock and was also designated a US Natural Landmark. A variety of fine trails criss-cross the landform.